Posted on November 21, 2006 by Alicia Bay Laurel	in Blog. After our pottery district walk, Yoko and Tetsuya drove me and Koki to pick up our bags and catch our plane back to Tokyo. 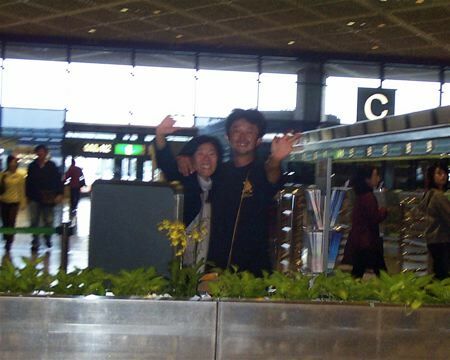 Kawashi and Hiromi came to see us off as well. 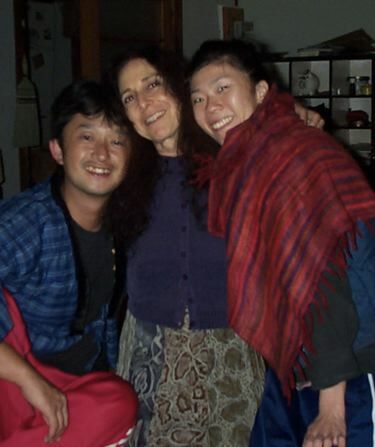 Sachiho could not, and who could, after the marathon of festivals, performances and parties that she had just created? I could only imagine she was doing what I would have been doing: lying still and breathing. A couple of days later, Koki took me to downtown Kamakura’s shopping district, where we paid our respects to Ayako’s grandmother in the cemetery of the gorgeous old Buddhist temple where she is interred, and bought the ingredients for a farewell dinner I would prepare for Koki and Ayako, Morio and his wife and daughter, for Miura-san and for Mayumi Hirai, who I hadn’t seen since we sailed back from Ohshima. I decided a Mediterranean menu would best suit the occasion, since it represents my heritage, and would consist of dishes my friends rarely were served. In the wok, I made a rich ratatouille, and I marinated chicken breasts overnight in a garlic vinaigrette to grill on the hibachi. I made a green salad with halved cherry tomatoes, chopped scallions, black olives, avocado, watercress and romaine, dressed with olive oil, balsamic vinegar, salt and pepper. Koki barbequed the chicken while I labored over the ratatouille. Of all the ingredients, the most exotic and intriguing to the Japanese palate is balsamic vinegar. Ayako was amazed to discover she could buy it at her corner grocery store. Japanese people do not heap large helpings of food on big plates the way we do in the USA. They serve very modest portions on a cluster of small plates and bowls. So, even though I served the Mediterranean dinner “family style” in the wok and large bowls at the floor table in Koki and Ayako’s main room, the meal ended up looking Japanese, portioned into their beautiful dishes. And, in typical Japanese style, lots of small gifts were exchanged. But, in California style, which evidently had invaded Japan since I last visited in 1974, lots of hugs were exchanged, too. 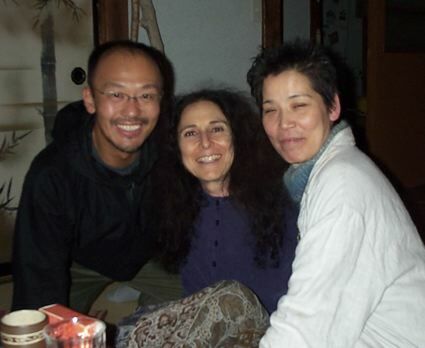 The next day Koki and Ayako drove me to Narita Airport, an astonishing place when I think about every other airport I’ve traversed. Friendly airline employees actually HELP YOU move your luggage. And it includes restaurants you’d actually patronize even if they weren’t at an airport (sorry, Wolfgang Puck). After I checked in my bags, we had some excellent sushi at one of these establishments, another one with a conveyor belt from which you could choose, or you could call out to the sushi chef for a custom order (which Koki did on our behalf). After lunch, we hugged goodbye for a good ten minutes and then I proceeded through the security check, and even THAT was friendly. As I was about to go down the escalator to immigration, I saw Koki and Ayako on the other side of the glass wall, waving goodbye. I kissed them goodbye through the glass, we all laughed, and then I was on my way back to Los Angeles.